Forsthaus Kasten is a family and excursion beer garden located in the nature protected landscape Forst Kasten (forest Kasten) near the Forstenrieder Park, southwest of Munich. Surrounded by nature, the beer garden is an ideal destination for walks or bicycle rides through the forest. The history of Forsthaus Kasten dates back to the beginning of the 13th century. In those days the Heilig Geist Spital zu München (Holy Spirit Hospital) was founded to take care of people in need. In 1308 the property Gut zu Kastel was sold to the hospital. Due to additional acquisitions and donations, the property increased in area until 1750 to its present size of 800ha. In 1899 the restaurant Forst Kasten opened, from where the forest ranger of this time sold small meals to passers by. Since 1990 the current leaseholder, Johann and Johanna Barsy, manage the restaurant and beer garden. The beer garden has about 2,000 seats in the self-serviced area, which is divided into several sections. Guests can unwrap their own food on beer garden tables in the main area with large trees and gravel ground or under sun umbrellas on a meadow next to cherry trees. 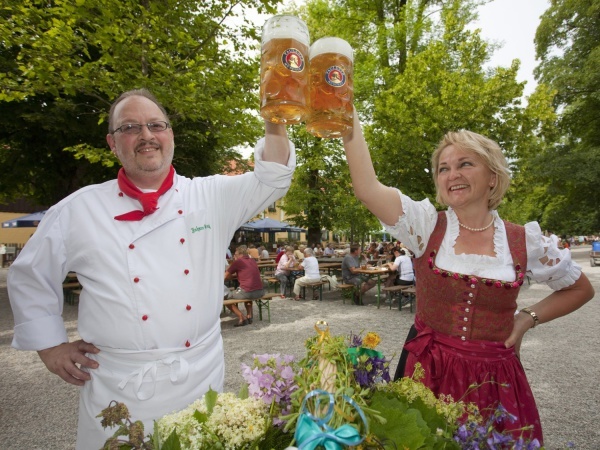 The food stalls offer traditional Bavarian meals and snacks, prepared from regional products and spiced with herbs from the property's own herb garden. Fresh Steckerlfisch (grilled fish on a stick) is also sold in the beer garden. On Sundays bread is baked in a stone oven next to the self-serviced area. The serviced area with 120 seats is located on the terrace under a large sun shade. The beer served is Paulaner and a Maß Helles costs €7.80 (May 2018). All beer is drawn straight from the tap. An adventure park with a climbing scaffold, trampoline and minigolf course entertains the kids. During the summer months music bands play regularly on a stage in the beer garden. Majour football tournaments are shown live on a big screen. From March/April to October and depending on the weather, the beer garden is open between 11am and 11pm on weekdays and generally already at 10am on weekends. Forsthaus Kasten is closed on Mondays and during the months of January and February. This page was last modified on 18 May 2018, at 18:57.